The police image of Dissident Dan. Police have either arrested and charged or interviewed and reported 58 people as a result of the Easter Monday trouble in Lurgan and an illegal parade in the town in May. 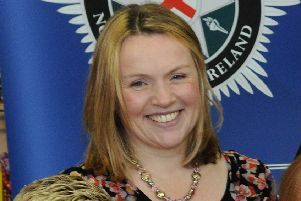 The figure was revealed in a social media post on the Craigavon PSNI account which appealed to young people not to get involved in violence. Laced with its now trademark humour the police post said: “Well in March and May, Dissident Dan and his mates had a few days out. True to form, Dan and his goons contributed to their communities in the only way they know how; with intimidatory gatherings, violence, disruption, and creating fear for locals. They even managed to hit their arch enemies... disrupting the dreaded Belfast to Dublin trains! “Unfortunately during that they also managed to drag several youngsters into the fray, encouraging them to get involved in violence and action against their own communities. Those youngsters were then abandoned by Dissident Dan and his mob to take the fall. “The message from the local majority was clear; we want to move on and away from this, and do not want it in our community. “We heard that, and we acted. The post added: “It is worth noting that many of those charged are not even from Lurgan. This shows the level of commitment Dissident Dan has to his community: Happy to wear a mask in the shadows, happy to get others to do their dirty work, but even happier for someone else to take the fall for them out in the street. Cowards who need a lesson on what it really takes to lead a community. Dissident Dan is even less representative than the Russian Olympic team. “This figure of 58 will continue to rise too... Any incidents which are shrouded in hatred, intimidation, paramilitarism, or large scale or organised violence will be dealt with robustly. “We have shown we have the means to do this, in order to protect the 99.9% who wish to keep moving forward and we will continue to do so. “Where there is evidence of an offence, our Public Order Enquiry Team will investigate these incidents whenever they occur, whoever is behind them, and wherever it takes us. “Finally, and most importantly, to the young lads out there who got involved in this or who were asked to get involved in this: let this be the warning. No doubt you were told by people you thought were ‘big men’ that they were with you, you were doing a good thing, and that you were defending your community? “Well, those supposed men are nothing but wee boys, representing no one’s interests but their own and caring about no one else either. They won’t be with you in the dock in court. If you’re sent to jail they won’t be with you there. They weren’t with you during interview either. They concluded with an appeal for anyone with information around any of these incidents to call them on 101, or call Crimestoppers anonymously.